Below are the official Hockomock League Boys Indoor Track All Stars. STOUGHTON, Mass. 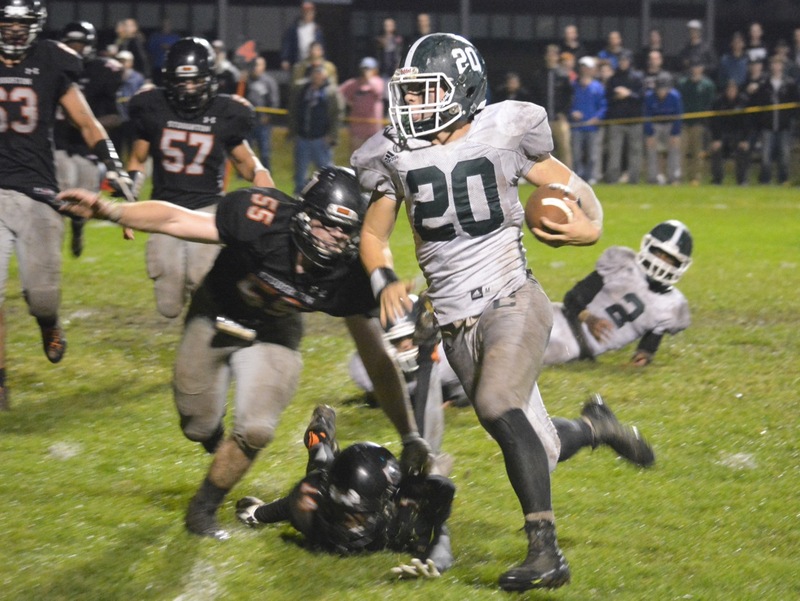 – The Bulldogs are becoming used to dramatic finishes and overtime battles, but there was something special about Friday night’s 22-21 victory over rival Stoughton at Anthony L. Sarno Field. When Jake Ragusa stopped Guy Eddy at the two-yard line on the final play of overtime, preventing the Black Knights from getting the two-point conversion that would have won the game, the Bulldogs stormed onto the field, cheering a win that keeps them in the Davenport title race, possibly clinches a spot in the postseason, and avenges last year’s heartbreaking defeat. Still, this felt like more than all of that. Even 20 minutes after they had cleared the field, with the players piled into two buses for the short ride back to Canton, the cheering had not abated. It felt like the Bulldogs had officially arrived and earned the marquee win to prove that this is a program to watch. As has been the case all season and as would be expected against a rival and a team that has been in the running for the Davenport title each year since the league split, the victory was not easy. The first half was ugly for the Bulldogs with the offense sputtering in the rain. Penalties and a pair of turnovers gave Stoughton the ball in Canton territory on its first three possessions. The Black Knights opened the scoring with 5:27 left in the first when Christian Hill’s 19-yard run set up a 1-yard Guy Eddy touchdown. But that was all Stoughton would get in the first half. 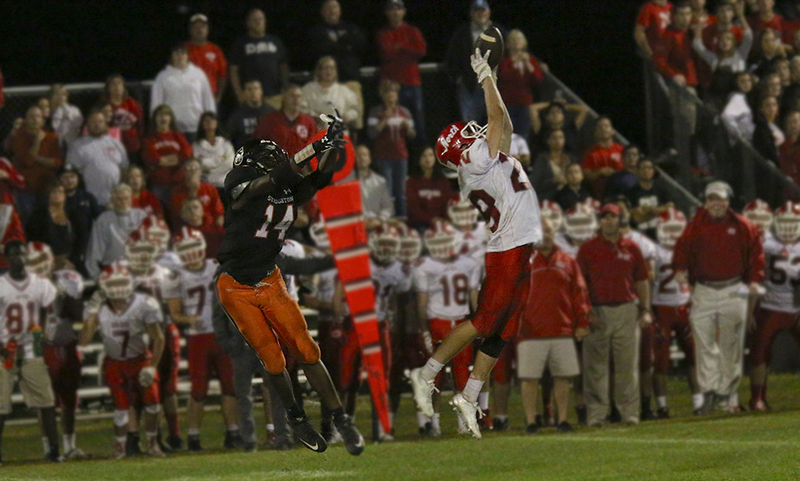 Ragusa sacked Stoughton quarterback Jake Gibb twice, sophomore Jude Albert showed the ability to stick with receivers downfield and the aggressive Bulldogs defense bottled up the ground game at the line of scrimmage. Canton finally got something going on its final possession of the half. Ragusa was the main man with nine carries for 59 yards on the drive and finished it with a two-yard dive that gave Canton the lead with 16 seconds before the break. The lead barely lasted to halftime. Steven Elice took the ensuing kickoff 90 yards to paydirt only to have his celebration cut short by a holding call at midfield. After the break, it was more of the same. The rain may have cleared but the field was still slick and the defenses were in control. Donnie Foley, Devlin Carroll, and Josh Czuba on the Stoughton side and Woanyen Mahn, Joe Bires, and Djimon Harding for Canton were all dominating play and neither side could find any rhythm offensively. The Black Knights finally got a spark when Elice recovered a Bires fumble at the Canton 35 with the clock winding under five minutes to play. Gibb hit Ryan Sullivan for 11 yards and a first down and then four plays later he hit Eddy in the flat and the running back took it 18 yards for the go-ahead score. The two-point conversion was no good and the lead was 12-7 with 2:41 left to play. Canton answered right back. The drive started at the Bulldogs’ 43 and was kept alive by junior quarterback Dennis Ross, who kept a fourth down play alive long enough to find Ragusa on the sideline for the first down. Three plays later, Ross looked downfield and found Michael Harris for a 35-yard touchdown pass into double coverage. Mahn added the two-point conversion and it was 15-12 Bulldogs with just 1:18 left. The Black Knights were not done. Similar to the game against Milford two weeks ago, the Canton defense let up for just a second and Gibb was able to hit Elice on a slant that went for 43 yards down to the Bulldogs seven with :32 seconds left. Gibb (8-17, 105) threw incomplete on first down, gained two yards on second and missed Eddy in the flat on third. Facing a fourth down decision, Stoughton received a delay of game penalty that backed the Knights up to the 10. From there, Burke made the choice to go with the field goal. Stoughton went for it and Gibb’s kick was hit by at least one Canton player (possibly two) but went through the uprights with 11 seconds left to send the game to overtime. On its first possession, Canton faced fourth down from the two and rather than go for a Thomas Monagle field goal, Bohane went to Ragusa (24 carries, 116 yards) and the senior plowed into the end zone for his second touchdown of the night. Gibb scored for Stoughton with a two-yard run of his own. Burke decided to go for two rather than try an extra point and the Knights gave the ball to Eddy on a sweep right but Ragusa read it all the way and made the stop that gave Canton the win. Bohane took a moment to reflect on where he was and the emotions of the evening. The Bulldogs have won four times this season and three of those were in OT, but Bohane admitted that this one felt a little different. Canton will go on the road to face Oliver Ames next Friday, while Stoughton will travel to Davenport leader Foxboro. STOUGHTON, Mass. – It’s not often teams can throw a sophomore under center and get the results North Attleboro did on Friday night. Chad Peterson earned the starting job at quarterback and in his fist career game, delivered a memorable performance as North Attleboro took down Stoughton, 14-6, in the HockomockSports.com Game of the Week. It was a battle of two stout defenses but it was Peterson who ended up making the difference for the Rocketeers. After North Attleboro’s defense forced Stoughton into a three and out to start the game, Peterson orchestrated an 11-play drive that went 63 yards for the lone offensive touchdown of the game for North. Peterson started with comfortable throws to Ridge Olsen for nine yards and Nick Rajotte for 17 yards. Another nine yard completion to Olsen and a six yard carry from Nick Morrison gave the Rocketeers a first down at the Stoughton 26. The next three plays resulted in just two yards and North faced a 4th and 8 from the 24. Johnson showed his confidence in the sophomore by not only electing to go for it, but letting Peterson throw it. Peterson looked calm in the pocket and delivered a perfect strike between two defenders to Olsen for 10 yards and a first. Two plays later, Peterson hit Morrison on the left side and he raced in for a 12 yard score. Connor Flynn’s extra point was good to make it 7-0 with 4:09 left in the first quarter. The defenses for both sides continued to put in good work. North Attleboro’s next four drives in the first half ended in a punt, a fumble, another punt and on downs. Stoughton’s second drive ended in a punt again but the third drive was when the offense clicked. On 2nd and 4 at their own 28, Stoughton went with running back Christian Hill (4 carries, 40 yards) for a gain of 26 yards. 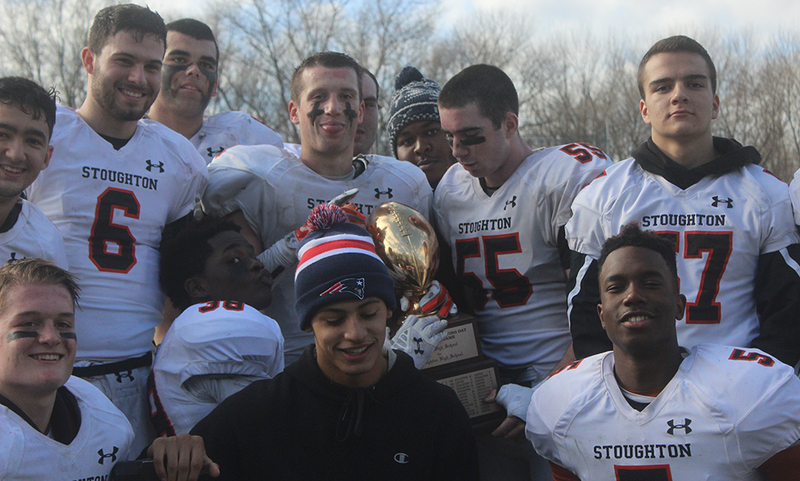 Ryan Sullivan rushed for three more and an incompletion had Stoughton facing a 3rd and 7. Gibb took the snap and fired a strike over the middle to Steven Elice who then did the rest of the work, racing past defenders on his way to a 43 yard touchdown. The extra point failed but the Black Knights cut the deficit to 7-6 with 10:28 in the second quarter. Stoughton nearly took the lead late in the half but were unable to convert. Taking over on North Attleboro’s 48 yard line after Stoughton’s Izon Swain-Price sniffed out a Rocketeer fake punt, Stoughton’s offense started to move. A run from Hill went for 16 yards and then one from Sullivan went for nine more Sullivan was able to get two more for a first down and Hill pushed the pile for three more. A penalty on North Attleboro gave Stoughton a first down at the 14 yard line but Tom Reynolds, Josh Morrison and Davon Andrade got to Gibb for a sack and an 11 yard loss. On the next play, Nick Morrison sacked Gibb again for a loss of five. Gibb hit Connelly for 12 yards to set up a field goal chance, but the kick was just wide to send the teams into halftime separated by just one point. Things got worse for the Black Knights at the break as Gibb, who has started since his sophomore year, was out for the second half with an upper body injury. Stoughton’s defense again came up big on the first drive of the second half as Sullivan intercepted Peterson. The Black Knights went three and out but got the ball back when Connelly forced a fumble on the punt return and Nick Hardy recovered it. But just a few plays later, North Attleboro got the ball back when Kyle Gaumond intercepted a pass from Dave Cellucci in the end zone. The Rocketeers produced their longest drive of the game, going 78 plays on 16 plays but Stoughton’s defense stood tall to stuff Peterson on a fourth down rush by a couple of inches. As Stoughton looked to try and take the lead, Gaumond came up big again. Gaumond elevated for an interception right around midfield and returned it the entire way for a 49 yard score. Connor MacIver’s extra point split the uprights to make it 14-6 with 1:38 left. On the ensuing kickoff, Hill took the ball all the way back in North Attleboro territory to the 38 yard line. Xzavian Marrero rushed for 15 yards and three from Sullivan put the Black Knights at the 20 yard line. The teams traded penalties before North Attleboro’s stepped in front to intercept a Stoughton pass to ice the game. Peterson finished 12/18 for 95 yards and a touchdown and 45 yards rushing on 13 carries. Ridge Olsen had five receptions for 39 yards and Nick Rajotte had three catches for 32 yards. Defensively, Gaumond had two interceptions, McCarthy had one pick and Bobby Mylod, Nick Morrison, Tom Reynolds, Josh Morrison and Davon Andrade all had their hand in at least one sack. For Stoughton, it will be a wait and see with Gibb. “I don’t know Gibbs scenario but it’s probably not good,” Stoughton head coach Greg Burke said. “But we just have to hang in there. Burke was happy with his defense, which allowed just one touchdown to North’s offense and kept the Rocketeers under 200 yards. The win marked North Attleboro’s first win over Stoughton since 2011 when the Rocketeers won in overtime. Both teams are in the D3 Southwest division for the playoffs so a rematch down the road could be in the cards. “Maybe we’ll see them later on this year,” Burke said. North Attleboro (1-0) will host Bishop Feehan (0-1) next Friday at Community Field. Stoughton will try to get back on track against the state’s top team Marshfield (1-0) on the road on Friday night. 1st Quarter: (NA) Chad Peterson 12 yard pass to Nick Morrison, Connor Flynn XP good. 2nd Quarter: (S) Jake Gibb 43 yard pass to Steven Elice, XP fail. 4th Quarter: (NA) Kyle Gaumond 49 yard interception return, Connor MacIver XP good. 1st Quarter: (A) Brendan Nunes 6 yard rush, Elijah Lewis XP good; Bishop Feehan 2 yard rush, XP fail; (A) Brendan Nunes 36 yard pass to Alex Silva, E. Lewis XP good. 2nd Quarter: (A) Tyler McGovern 1 yard rush, Lewis XP good; (A) B. Nunes 1 yard rush, E. Lewis XP good; Bishop Feehan 90 yard kickoff return, XP good; (A) T. McGovern 1 yard rush, E. Lewis XP good. 3rd Quarter: (A) T. McGovern 1 yard pass to Jon Dunn, E. Lewis XP good; Bishop Feehan 33 yard pass, 2pt fail; Bishop Feehan 46 yard pass, XP good; (A) B. Nunes 53 yard rush, 2pt fail. 4th Quarter: (A) Cam Furtado 14 yard pass to A. Silva, E. Lewis good. 2nd Quarter: (C) Jake Ragusa 3 yard rush, Thomas Monagle XP good; (C) Joe Bires 3 yard rush, T. Monagle XP good. 3rd Quarter: Rockland 20 yard rush, XP good. 4th Quarter: (C) T. Monagle 25 yard field goal good; Rockland 7 yard pass, XP good. 1st Quarter: Westwood 36 yard pass, 2pt fail; (F) Ronnie Martin 6 yard rush, XP good. 2nd Quarter: Westwood 50 yard pass, XP fail; (F) John Cronin FG good. 3rd Quarter: (F) Daren Kelly 7 yard pass to Connor McNamara, M. Clagg 2pt rush. 4th Quarter: (F) D. Kelly 15 yard pass to Jason Procaccini, XP good; Westwood 2 yard rush, 2pt good. 1st Quarter: East Bridgewater 8 yard rush, XP good. 2nd Quarter: East Bridgewater 46 yard pass, XP good. 3rd Quarter: East Bridgewater 80 yard kick return, XP fail. 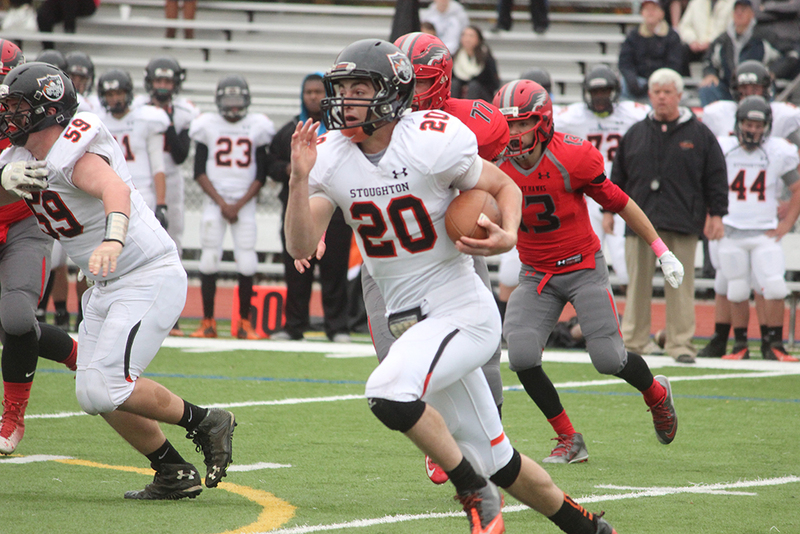 1st Quarter: (M) Brian Lynch 5-yard rush, XP good; St. John’s Prep 22-yard pass, XP good. 2nd Quarter: St. John’s Prep 60-yard rush, XP good. 3rd Quarter: St. John’s Prep 52-yard pass, XP good; (M) B. Lynch 2-yard rush, XP good. 4th Quarter: St. John’s Prep 29-yard pass, XP good; St. John’s Prep 19-yard pass, XP good; St. John’s Prep 13-yard rush, XP good. 1st Quarter: Marlborough 75 yard kickoff return, XP good; Marlborough 11 yard run, XP good. 2nd Quarter: Zach Lanzetta 21 yard pass to Blake Hill, Sean Lehane XP good; B. Hill 3 yard rush, S. Lehane XP good. 3rd Quarter: Marlborough 6 yard rush, XP good. 4th Quarter: Z. Lanzetta 25 yard pass to Tony Mobilia, 2pt fail; S. Lehane 21-yard FG. 2nd Quarter: Jared Tage 13 yard pass to Brian Cherenfant, Jason DaRosa 2pt rush. 3rd Quarter: J. DaRosa 5 yard rush, 2pt fail. 4th Quarter: J. DaRosa 2 yard rush, 2pt fail. Attleboro, 0 @ Sharon, 1 – Final – Jake Goloboy scores the lone goal of the game three minutes into the second half to give the Eagles their first win of the season. Goloboy’s goal was set up when Matt Lowerre fed Sunny Somdah a through ball and Somdah got to the ball and cross over to Goloboy for the goal. Franklin, 2 @ Foxboro, 0 – Final – Franklin’s Kevin Hall headed home a cross from Austin Kent in the first half and then Kent converted a penalty kick in the second half to give Franklin its first win of the season. King Philip, 0 @ Milford, 3 – Final– Milford freshman Joey Madden scored his first career goal just over 10 minutes into the game to give the Scarlet Hawks the lead. In the second half, Sttarley Flores found the back of the net after a great feed from Justin Borges. Borges then tacked on the third goal shortly before the final whistle on an assist from Jon Torres. Milford goalie Mike Da Silva made eight saves in net. North Attleboro, 0 @ Stoughton, 1 – Final – Loubensky Lucas volleyed in a corner from Jordan Asnes in the 30th minute for the lone goal of the game. North Attleboro goalie Rob Heaney played well for the Rocketeers with six saves. Taunton, 0 @ Oliver Ames, 3 – Final – Oliver Ames seniors Chris Romero and Keegan Nutt and junior Thomas McCormick all scored once and picked up an assist as the Tigers rolled. Jack Carroll made two saves in net to record his second straight shutout. Head coach John Barata said Nathaniel Cardoza and Cam Vella played “extremely well” in the midfield while Jared Mallers, Max Ahearn and Max Bamford guided the Tigers defense to its second straight shutout. Sharon, 2 @ Attleboro, 3 – Final – Rebekah Entwistle scored two goals in the opening six minutes of the game and Kayla Merritt added the Bombardiers third. Paige Medeiros had two assists for Attleboro. Foxboro, 0 @ Franklin, 2 – Final – The Panthers got goals from defenders Meghan Dieterle and Nadia Havens to earn their first win of the season. Milford, 2 @ King Philip, 3 – Final – Nicole Dahlgren scored two minutes into the game for Milford and 13 minutes later KP tied the game on a penalty by Emma Corcoran. Seven minutes later, the Warriors took the lead on a header by freshman Logan Greenburg off a corner by Lauren Hehn. Milford tied the game on a Kristen Franzini penalty in the 28th minute. With nine minutes left, KP found the winner when Elizabeth Cooley found the top corner from 25 yards off an assist by Kelly McSweeney. Attleboro, 0 @ Sharon, 3 – Final – Sharon grabbed its first win of the season with a 25-14, 25-17, 25-23 win over the Bombardiers. Mansfield, 0 @ Canton, 3 – Final – Canton moved to 2-0 on the season with a 25-14, 25-20, 25-15 win over the Hornets. Olivia Devoe had another big game at libero with 20 digs, Elizabeth Hamilton had a game-high 15 kills, Rye Verille chipped in with seven kills and three blocks. Head coach Pat Cawley said Sarah Reissfelder and Emma Murphy were strong at the net. For Mansfield, Cathryn Heavey recorded 27 assists and Meg Hill had five kills. Franklin, 3 @ Foxboro, 2 – Final – Franklin was able to edge the Warriors 21-25, 25-21, 8-25, 29-27, 15-12. Franklin’s Dayna McCue had a match-high 47 serve receives and added 14 digs, Alyssa Shea had 11 kills, Caroline Maguire also had 11 kills and added a pair of blocks and aces while Beth Neal had 27 assists, eight kills and four aces for the Panthers. King Philip, 3 @ Milford, 0 – Final – King Philip swept by the scores of 28-26, 25-17 and 25-10. Emma Lopez had four aces for the Warriors, Josie Rowean had 12 kills and Micaela Murray had a team-high in digs. King Philip moved to 2-0 on the season. North Attleboro, 1 @ Stoughton, 3 – Final – Stoughton won the first game 25-19, North Attleboro battled back with a 25-23 win in the second game but Stoughton won out, 25-19 in the third set and 26-24 in the fourth set. Stoughton senior Bianca DeSousa shined for the Black Knights with 19 digs, 11 assists, six aces, six kills and three blocks. Bridgette Whalen had nine blocks, seven kills and 14 digs and Ava Siegel added five kills and 22 digs for Stoughton. Taunton, 3 @ Oliver Ames, 0 – Final– Taunton swept 25-21, 25-13, 25-21. Tatum Speicher shined with 25 assists and two aces while a pair of Tiger middle hitters played well at the net. Alyssa Gibson had four kills and three blocks and Aimee Kistner had seven kills, three aces and a block. Attleboro, 8 @ Sharon, 0 – Final – Attleboro jumped out to a 3-0 lead at halftime and added five more goals in the second half to move to 2-0 on the season, still yet to surrender a goal. Grace Mayer and Emily Houle each scored twice for the Bombardiers. Mansfield, 2 @ Canton, 1 – Final – Caroline Maher and Emily Ierardo each scored a goal for the Hornets, who moved to 2-0 on the season. Canton senior Abby Powers scored her first varsity goal on an assist from Caroline Hagan as the Bulldogs suffered their first loss this year. North Attleboro, 1 @ Stoughton, 3 – Final – Olivia Schlehuber, Erika Paul and Mia Russell each scored a goal to lift Stoughton to 2-0 on the season. Taunton, 161 @ Franklin, 170 – Final – Taunton’s Mario Wilson shot a match-low 38 to pace Taunton. Ryan O’Berg and Kaynel Gonsalves each shot 40. Franklin’s Matt Dao shot a 40 and Matt Pleshaw shot a 41. Attleboro, 173 @ Canton, 149 – Final – Sophomore Jack Goyetch shot a match-low 36 to lead the Bulldogs. Senior Steve Gorham shot a 37 while juniors Pat Duggan and Jackson Maffeo both shot 38. Attleboro Senior Keagin Larkin carded a team-low 41.